Jiangsu is a nine hundred kilometre-long Chinese province on the eastern-central coast, just to the north of Shanghai. Home to many of the world’s leading technology exporters, Jiangsu is noted as the most highly developed province in China, and has long been the largest beneficiary of overseas investment. But, as much a financial powerhouse as it is a testament to historic culture, Jiangsu has become an appealing tourist destination, with extravagant gardens, canals and renditions of China’s oldest opera. In the past, Jiangsu earned its wealth through silk and salt exportation, but today, the tourist industry is booming, with visitors flocking here all year round for the choice of classic national attractions, including the Humble Administrator’s Garden in Suzhou. Widely regarded as the finest in southern China, it was first built during the Shaoxing period in the twelfth century, linked together by a series of sparkling pools and waterside pagodas. Fed by the massive Yangtze River, a huge network of waterways penetrates deep into the province, with the famous Grand Canal, the longest in the world and a UNESCO World Heritage Site, meandering through most cities. Moreover, Jiangsu is celebrated for its charming canal towns, much likened to Venice. The idyllic water town Zhouzhuang is also one of the last places on earth where bird-fishing is still practiced, when fishermen work alongside cormorants to catch particularly large river species. Jiangsu’s capital, Nanjing, was the primary city throughout six ancient dynasties. Subsequently, it boasts numerous historic monuments and landmarks including the Ming tombs and the six hundred year-old ‘Gate of China’, designed with the most complex gated structure in the world. 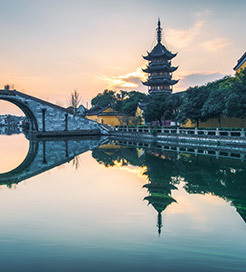 For Islamic relics and ancient shrines, head to Yangzhou at the northern end of the Yangtze, while the city of Wuxi is recognised for its eighty metre-high Buddhist statue and one of the largest freshwater lakes in the country. Getting the ferry to Jiangsu? International ferry crossings are available from the South Korean city Incheon, an important transportation hub, bordering the capital, Seoul. Operated by LYG Ferry, the twice-weekly, long-haul crossings take you to Lianyungang City in northeast Jiangsu.